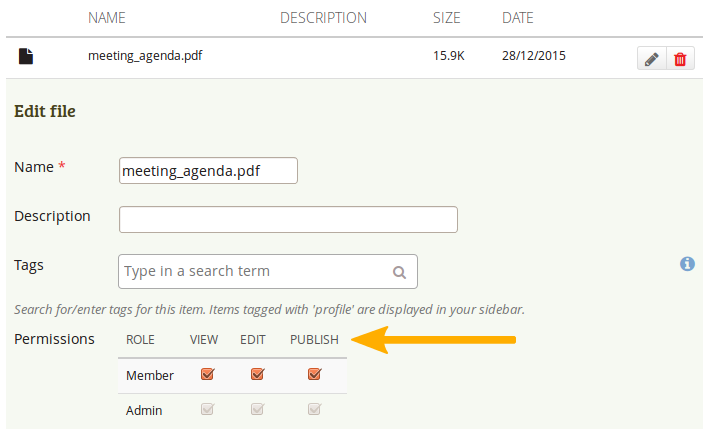 Group name and navigation items within the group. You see all the areas that you have access to in the group. If you are not allowed to edit pages, you will not see the “Share” tab, for example. 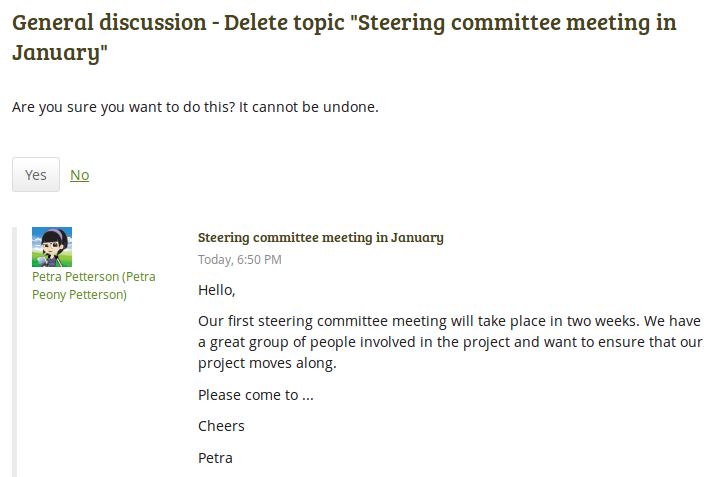 Click the Delete group button if you want to permanently delete the group. 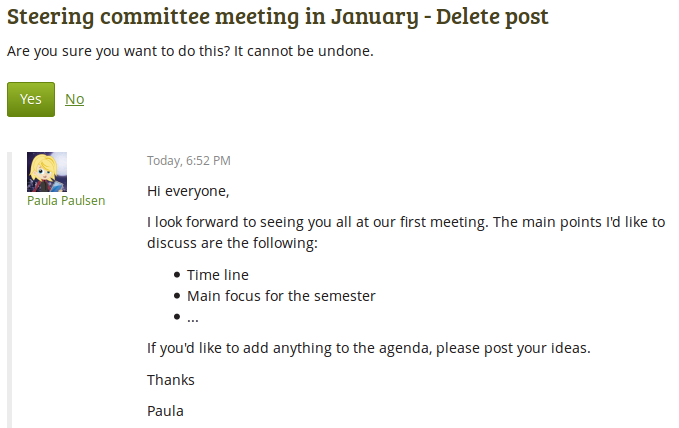 Group members will receive a notification about the deletion. Once you deleted a group, you cannot retrieve its content anymore. You cannot export forums or group pages. 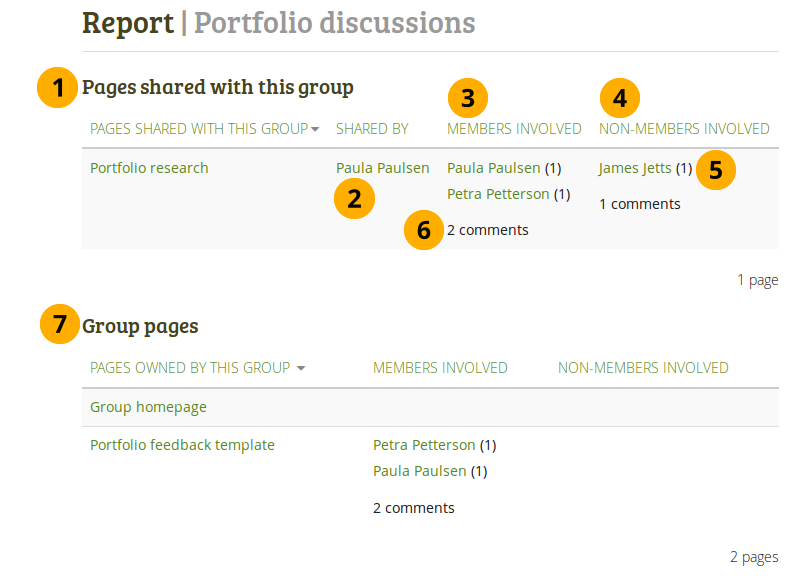 If you wish to keep group pages, you will need to copy them into your own portfolio (or another group). Pages that have been shared with the group are not deleted. 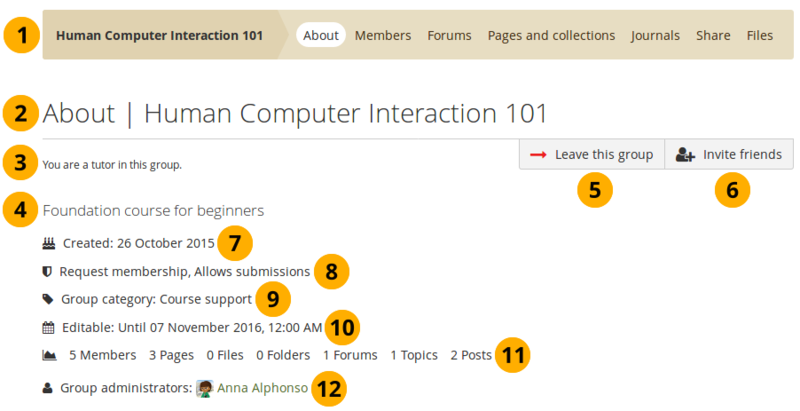 This means that users are displayed according to their roles: First are administrators, then tutors, and members come last. Remove a user from the group by clicking the Remove from group button. 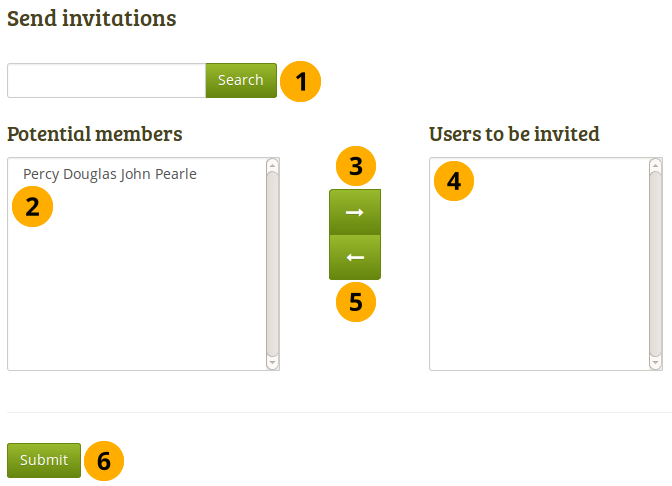 Decide how many members you want to display per page. You can also double-click a name to move it from one side to the other. If the group administrator allowed membership recommendations when creating or editing a group, group members can recommend the group to their friends by clicking the Recommend to friends button on the group homepage. for making changes to the forum settings. 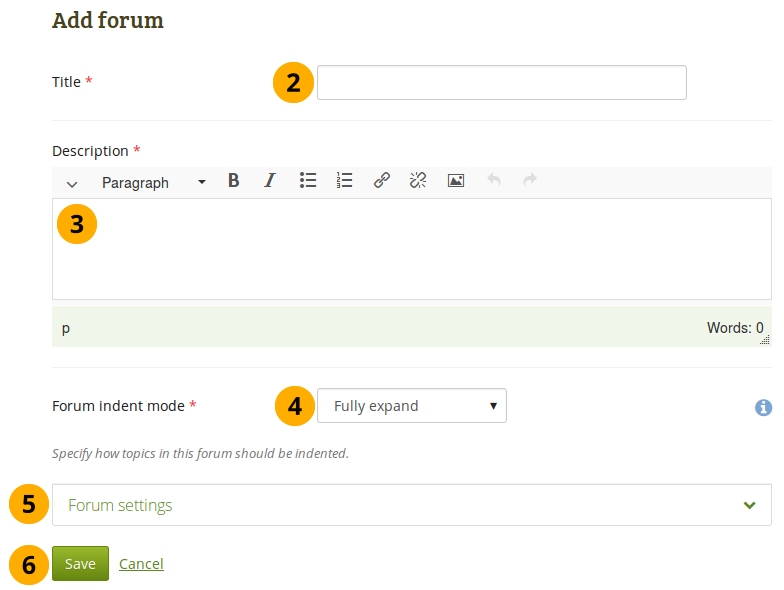 Click the New forum button to set up a new forum. 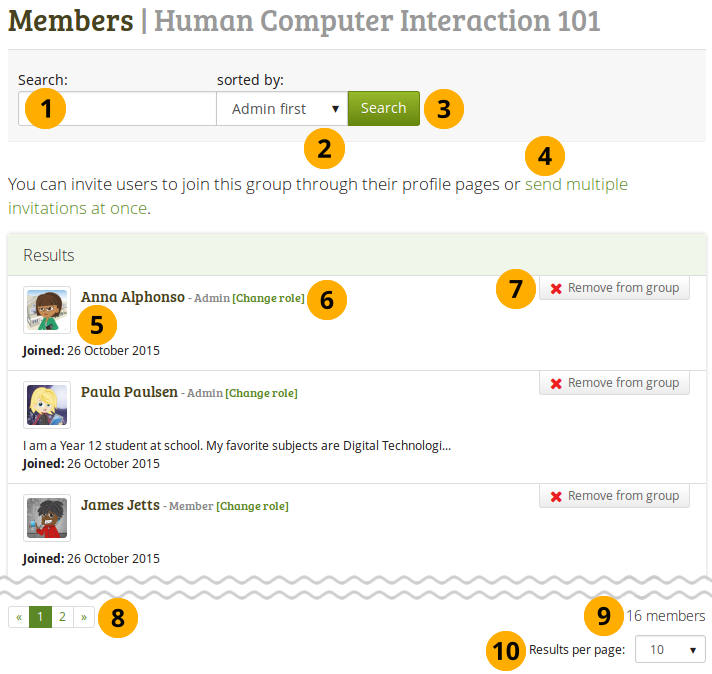 Who can create topics: Decide who in your group is allowed to create topics within that forum. 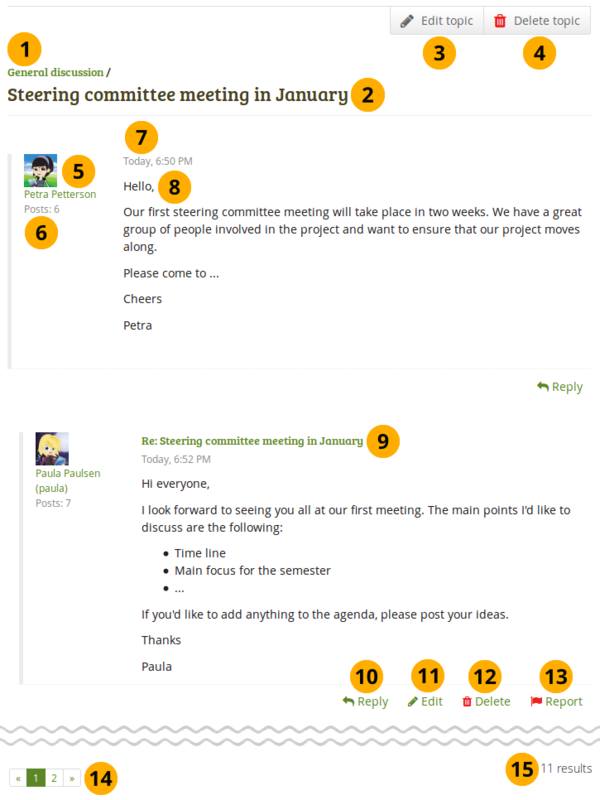 If set to “All group members”, any group member can create new topics and reply to existing topics. 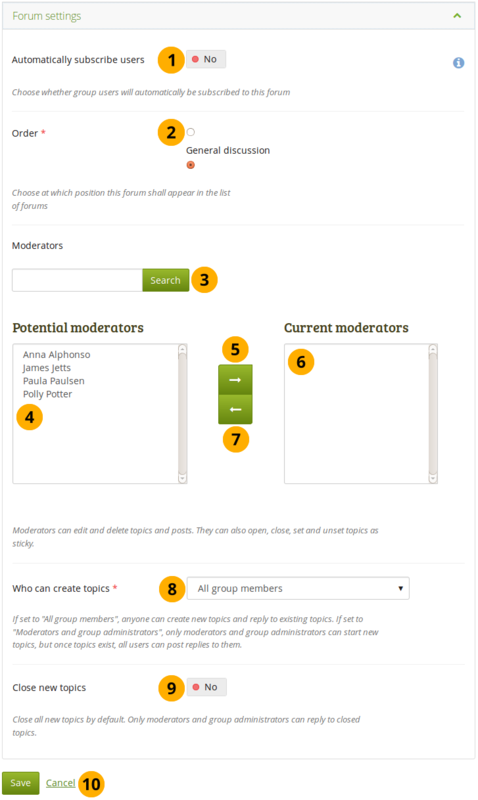 If set to “Moderators and group administrators”, only moderators and group administrators can start new topics, but once topics exist, all users can post replies to them. 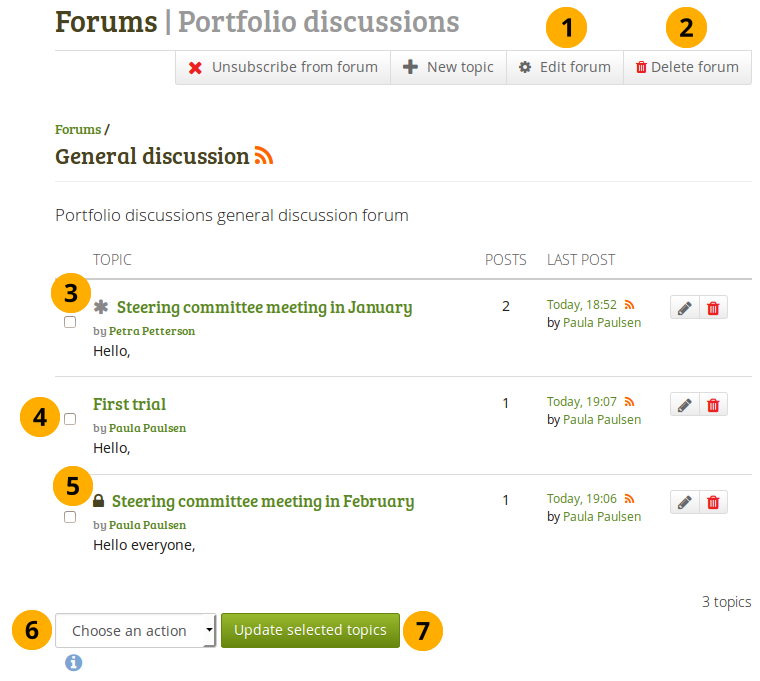 Close new topics: If switched to “Yes”, all new topics in this forum will be closed by default. Only moderators and group administrators can reply to closed topics. This is a setting that may be useful for a forum that is solely used for announcements. Send message now: If switched to “Yes”, the notification about your forum post is sent immediately instead of waiting for the forum post delay time to pass. You can still edit your message normally. 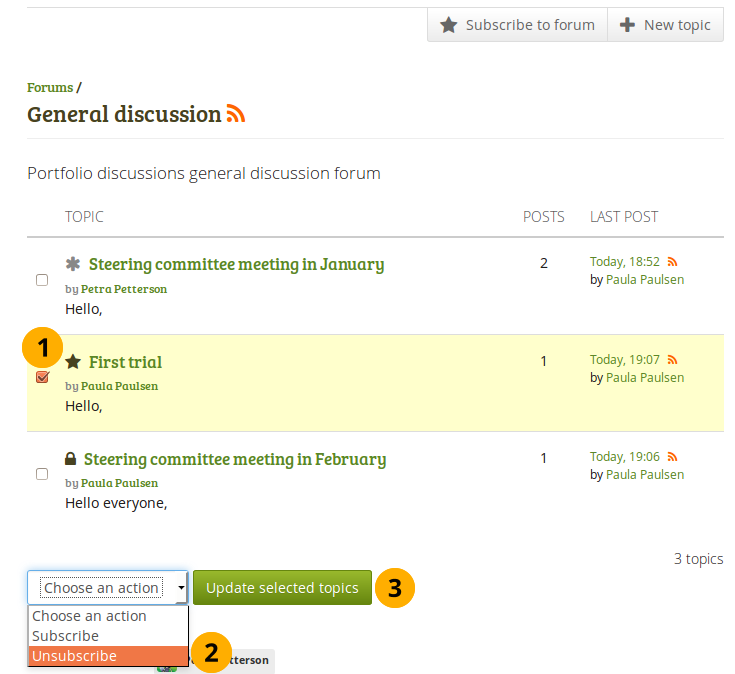 The person starting the forum topic and the group administrator as well as forum moderator have the Edit topic button to make changes to the initial post. 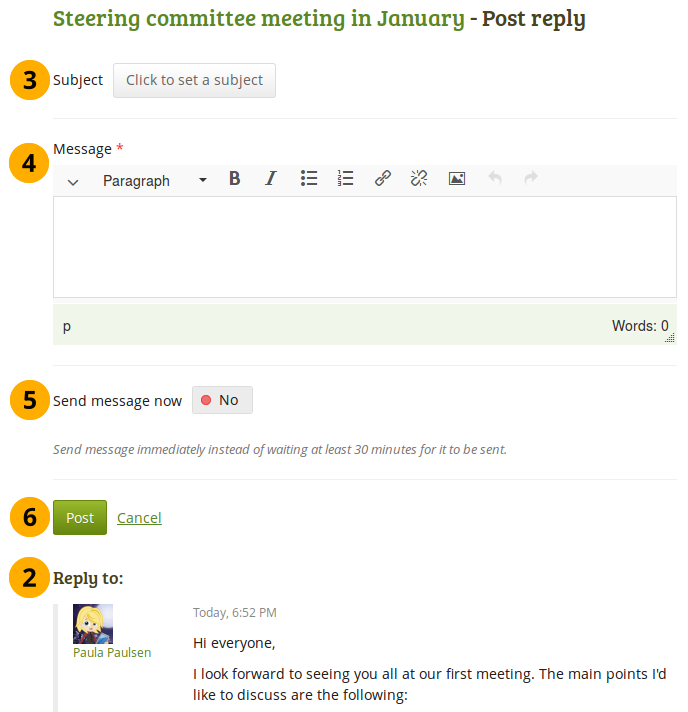 The forum post that you are replying to is displayed beneath your reply window making it easier for you to refer to it if necessary. 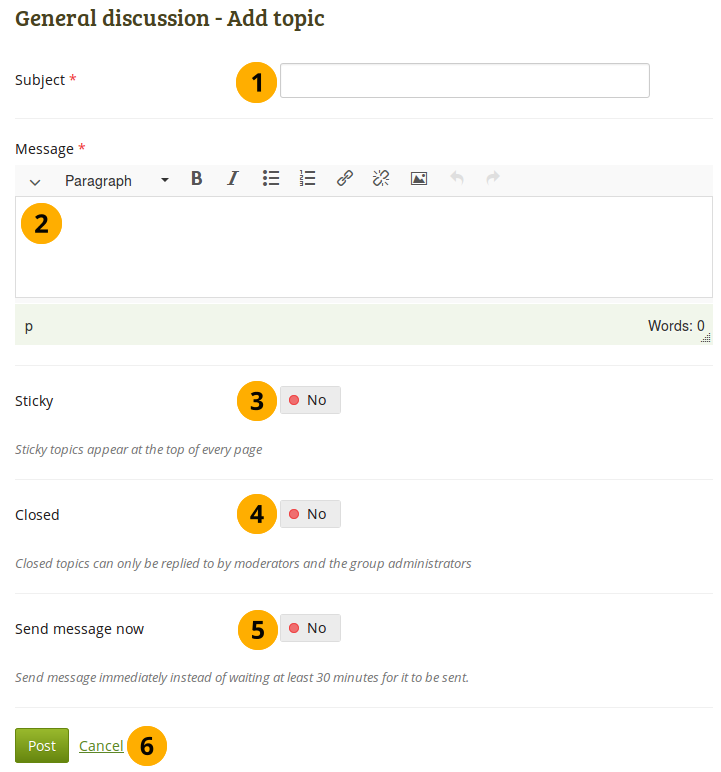 Send message now: If checked, the notification about your forum post is sent immediately instead of waiting for the forum post delay time to pass. You can still edit your message normally. Click the Update selected topics button to save your changes. The possibility to subscribe to and unsubscribe from individual forum topics is useful in community groups for example, where there are a lot of discussions in one forum, but you are only interested in a select few. Make sure that you are not subscribed to the entire forum. You should see the Subscribe to forum button. Click the Unsubscribe from forum button if necessary. Otherwise, you will not be able to complete the following steps. Choose the option Subscribe from the Choose an action drop-down menu. 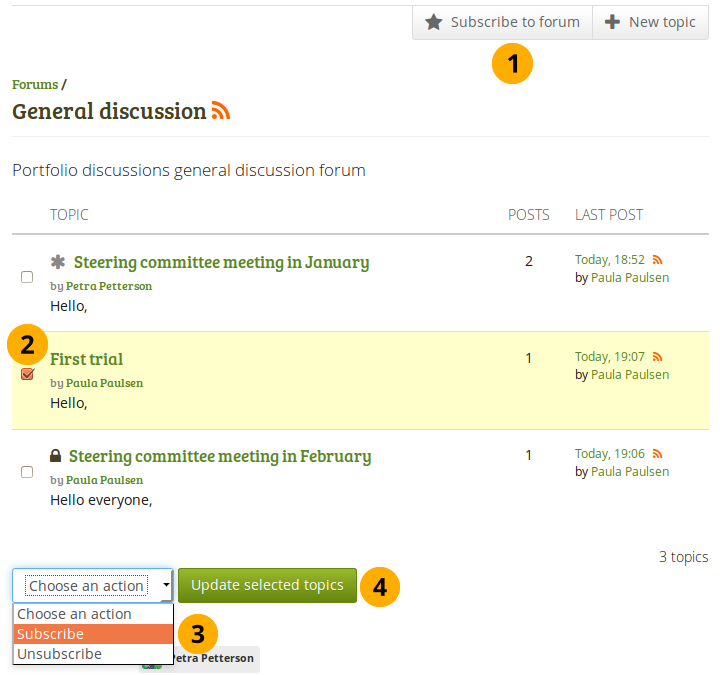 The forum topics to which you are subscribed, get the Subscribed star icon . Select the individual forum topic(s) from which you wish to unsubscribe. Choose the option Unsubscribe from the Choose an action drop-down menu. Click the Update selected topics button to save your changes. You are no longer subscribed to the topics that you had selected. 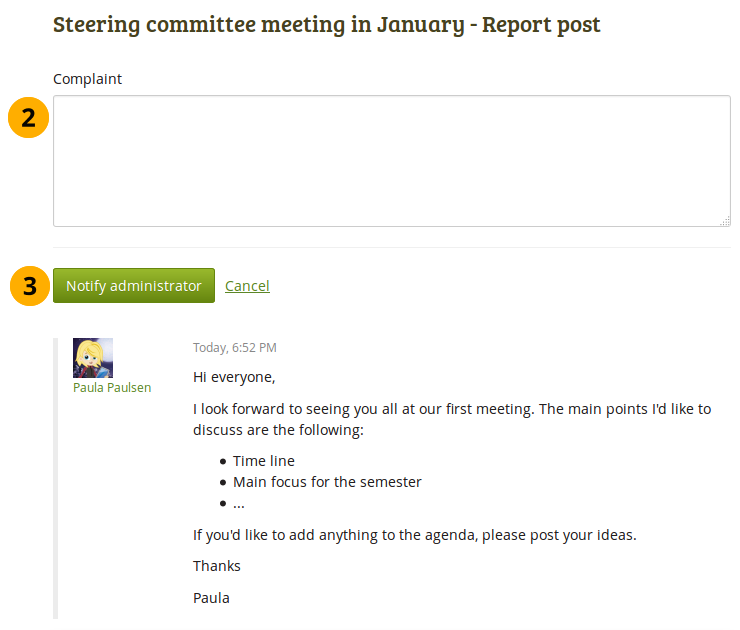 Group members can report forum topics and individual forum posts as objectionable. When you want to report an entire forum as objectionable, then you need to report the first forum post as that started the forum topic. 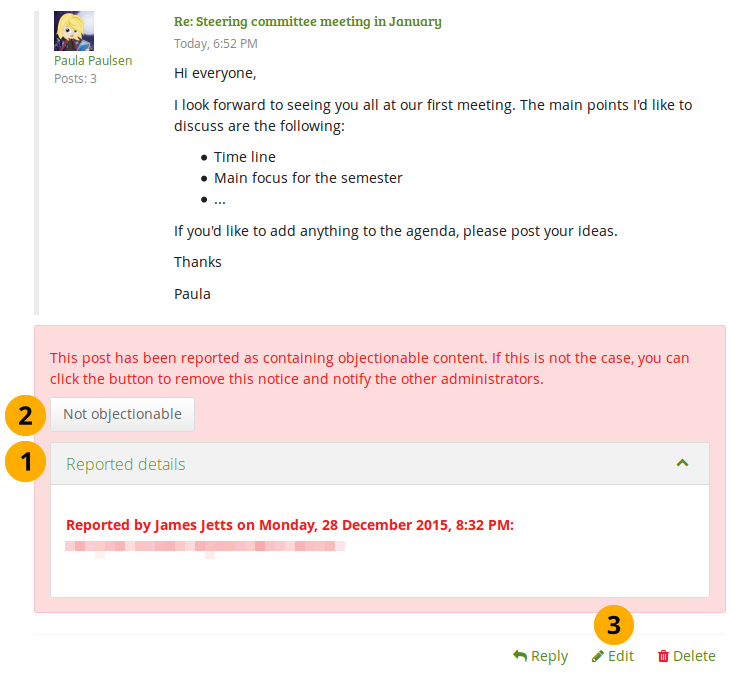 Other regular group members do not see that a forum topic or post was reported as objectionable. 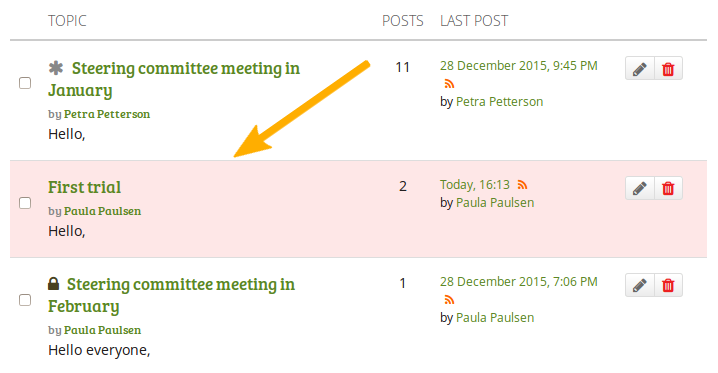 When an administrator or forum moderator is in a forum that contains a topic or post that was reported as objectionable, they see the topic in question highlighted. An administrator or forum moderator can see more details about the topic or post in question. Click the Not objectionable button if you think this post does not contain objectionable content. A notification is sent to the group administrators, forum moderators, and site administrators. Similarly to group homepages and users’ personal portfolio, group portfolios can also have human-readable URLs if the site administrator activated clean URLs. 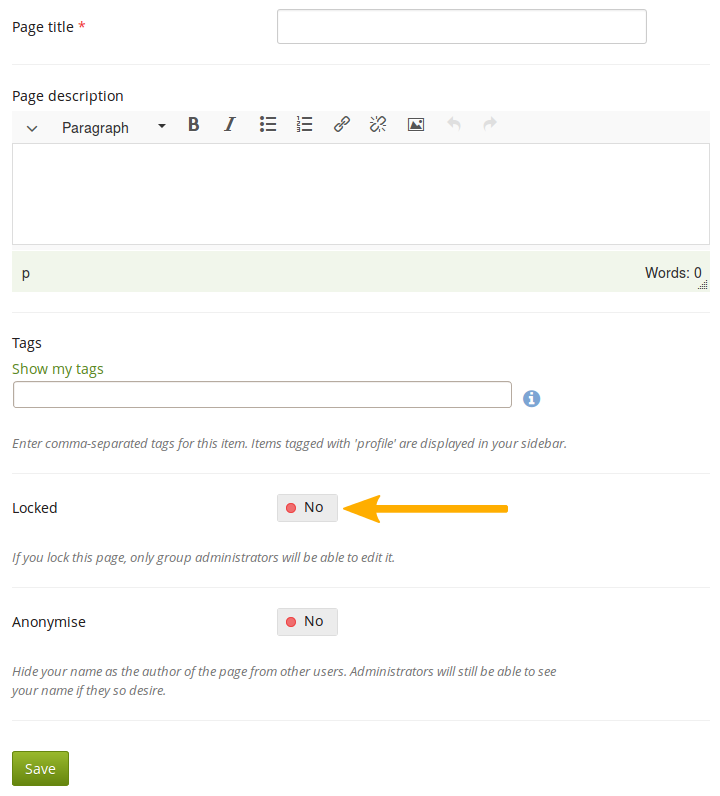 When a group page is created, group members (except the page creator) receive a notification unless the group administrator switched the setting Shared page notifications to “No” in the group settings. You can sort each of the columns. The column that is currently sorted, has a little ascending triangle or descending triangle next to it.